Lord Caitanya, give me shelter under his lotus feet? Their associates, Sri Lalita and Visakha. lover of Radharani. I offer my respectful obeisances unto You. daughter of King Vrsabhanu, and You are very dear to Lord Krsna. desire trees, and who are full of compassion for the fallen souls. 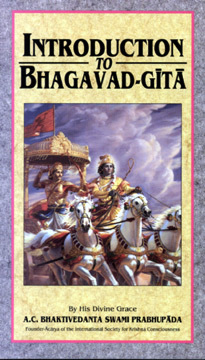 Bhagavad-gita is also known as Gitopanisad. It is the essence of Vedic knowledge and one of the most important Upanisads in Vedic literature. Of course there are many commentaries in English on the Bhagavad-gita, and one may question the necessity for another one. This present edition can be explained in the following way. Recently an American lady asked me to recommend an English translation of Bhagavad-gita. Of course in America there are so many editions of Bhagavad-gita available in English, but as far as I have seen, not only in America but also in India, none of them can be strictly said to be authoritative because in almost every one of them the commentator has expressed his own opinions without touching the spirit of Bhagavad-gita as it is. The spirit of Bhagavad-gita is mentioned in Bhagavad-gita itself. It is just like this: if we want to take a particular medicine, then we have to follow the directions written on the label. We cannot take the medicine according to our own whim or the direction of a friend. It must be taken according to the directions on the label or the directions given by a physician. Similarly, Bhagavad-gita should be taken or accepted as it is directed by the speaker himself. The speaker of Bhagavad-gita is Lord Sri Krsna. He is mentioned on every page of Bhagavad-gita as the Supreme Personality of Godhead, Bhagavan. Of course the word "bhagavan" sometimes refers to any powerful person or any powerful demigod, and certainly here Bhagavan designates Lord Sri Krsna as a great personality, but at the same time we should know that Lord Sri Krsna is the Supreme Personality of Godhead, as is confirmed by all great acaryas (spiritual masters) like Sankaracarya, Ramanumjacarya, Madhvacarya, Nimbarka Svami, Sri Caitanya Mahaprabu and many other authorities of Vedic knowledge in India. The Lord Himself also establishes Himself as the Supreme Personality of Godhead in the Bhagavad-gita, and He is accepted as such in the Brahma-samhita and all the Puranas, especially the Srimad- Bhagavatam, known as the Bhagavata Purana (Krsnas tu bhagavan svayam). Therefore we should take Bhagavad-gita as it is directed by the Personality of Godhead Himself. Arjuna was in a relationship with the Lord as friend. Of course there is a gulf of difference between this friendship and the friendship found in the material world. This is transcendental friendship which cannot be had by everyone. Of course everyone has a particular relationship with the Lord, and that relationship is evoked by the perfection of devotional service. But in the present status of our life, we have not only forgotten the Supreme Lord, but we have forgotten our eternal relationship with the Lord. Every living being, out of many, many billions and trillions of living beings, has a particular relationship with the Lord eternally. That is called svarupa. By the process of devotional service, one can revive that svarupa, and that stage is called svarupa-siddhi- perfection of one's constitutional position. So Arjuna was a devotee, and he was in touch with the Supreme Lord in friendship. How Arjuna accepted this Bhagavad-gita should be noted. His manner of acceptance is given in the Tenth Chapter. Now one may think that because Krsna was the friend of Arjuna, Arjuna was telling Him all this by way of flattery, but Arjuna, just to drive out this kind of doubt from the minds of the readers of Bhagavad-gita, substantiates these praises in the next verse when he says that Krsna is accepted as the Supreme Personality of Godhead not only by himself but by authorities like the sage Narada, Asita, Devala, Vyasadeva and so on. These are great personalities who distribute the Vedic knowledge as it is accepted by all acaryas. Therefore Arjuna tells Krsna that he accepts whatever He says to be completely perfect. Sarvam etad rtam manye: "I accept everything You say to be true." Arjuna also says that the personality of the Lord is very difficult to understand and that He cannot be known even by the great demigods. This means that the Lord cannot even be known by personalities greater than human beings. So how can a human being understand Sri Krsna without becoming His devotee?